Nico Rosberg plans to discuss concerns with Mercedes team-mate Lewis Hamilton that their fight for victory in Bahrain went "over the line". Hamilton won the race, but Rosberg claimed the Briton had been too aggressive on one occasion. Rosberg, who was second, said it was "normal" to reflect after "intense battles", adding: "We are doing that to be able to put it behind us." The incident in question happened at Turn Two on lap 18. Hamilton cut across Rosberg to retain the lead, claiming the move was necessary to ensure he was better placed to defend his position on the run down to Turn Four. Rosberg felt the speed at which Hamilton came across him was "above the limits" and said he might "struggle to avoid" an accident if he was pushed out too quickly in future. 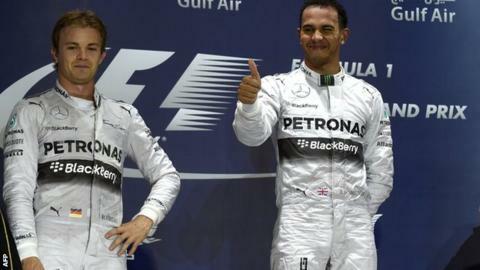 The two men will review the race with their team on Thursday, ahead of practice at the Chinese Grand Prix on Friday. Rosberg underlined the issue was not a big concern and said he did not expect it to be a problem for the drivers. "It's likely it will continue to be a close battle," said the German, who leads the standings. "It was a big thrill and an enjoyable fight. That is what racing is about. "It is not the first time we've had a battle, or the first time it's been a little bit close. We have had so many, right back to 12 years old." Hamilton, the 2008 world champion, said he had watched a re-run of the race after returning from Bahrain. "It was quite an exciting race," he said. "I got to spend some time at home with the family at the weekend and we watched the highlights. "It was quite interesting to see the duel between each team and between team-mates. It was a bit more like a go-kart race. I hope there are more races like that through the year."